It’s summer- the ideal season for slacklining! You know how much I like trying out new sports and activities and then sharing them with you of course…well, my latest is the slackline, or slacklining. If you love watching tightrope walkers, or are a fan of the film “Man on Wire” which tells the story of French high-wire artist Philippe Petit, who in 1974 crossed an estimated 200 feet between the Twin Towers of the World Trade Center in NY – then this activity is for you! 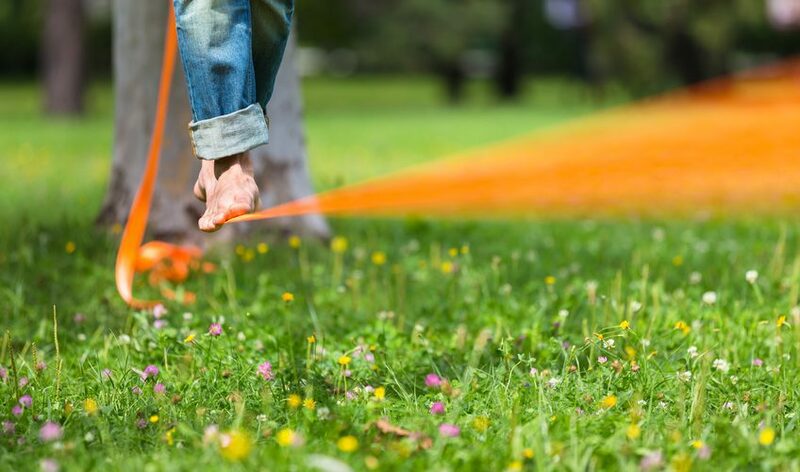 If you enjoy challenging yourself to something new, or would simply love to discover a new sport that the whole family will enjoy, don’t hesitate to try slacklining! Slacklining is the art of walking on a rope or strip of flat webbing stretched between two trees, poles, or any other strong anchor. This activity can be done barefoot or with shoes. Your arms help you maintain balance. 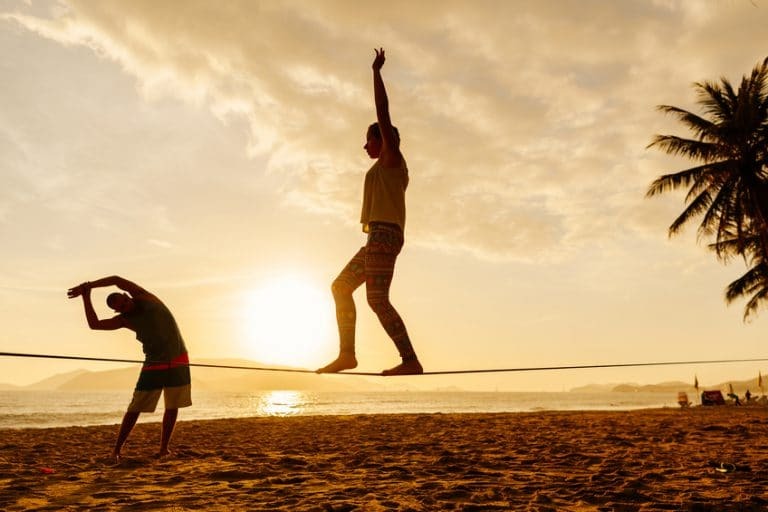 Although this sport is akin to tightrope walking, it is not dangerous because slacklines can be placed as low as 8 inches / 20 cm from the ground for beginners. Yes, it’s an excellent activity for both the body and mind! Intense concentration: a great way to forget your problems as this activity demands you to focus on the present moment to avoid falling. It is what I call a “Flow Activity”. Strengthens the ankles: for me who suffered several fractures and underwent a serious operation to remove a bone in my right ankle a few years ago, this activity is very intense, but after trying it only a few times, I am already experiencing better stability in my ankles. Balance: this one is a no-brainer! You certainly improve your balance in slacklining :). Yes! If you are a beginner, you’ll first find your balance by standing on the line with just one leg (the other raised leg helps you maintain balance), and then try taking a step or two. Then you learn to sit upright on the line, first with one foot on the line and the other foot helping you keep balance, and then with both feet on the line. 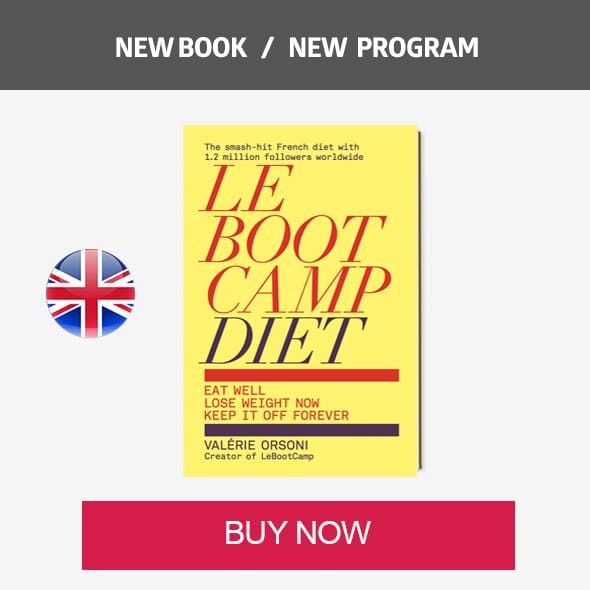 From that point on, it works like any new activity: the more you do it, the more you progress. The pros have all told me the same thing: only after 2 or 3 days of slacklining can you truly measure your progress! Take care where you hang your slackline: avoid damaging trees or structures. If you have health concerns related to balance, high-blood pressure, etc., as always, check with your doctor that you can do this kind of activity. Concentrate on breathing well, and focus straight ahead (towards the horizon) to reduce the number of falls :). If you try slacklining this summer, I would love to see pictures of you doing it! 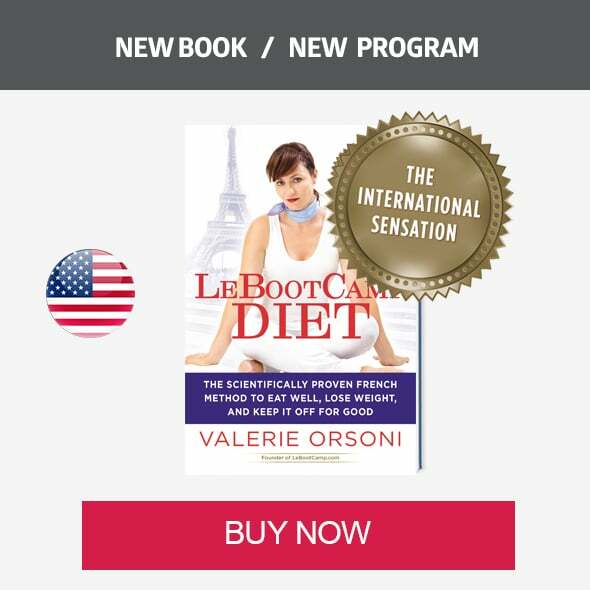 Tag me @valerieorsoni with #LeBootCamp #valerieslackline hashtags and I’ll follow you!